Born from the end of a rainbow, this city is a technicolor wonderland, with its modern and ancient architecture painted in myriads of different shades that give a vivid and lively character to the town. Wroclaw is the largest city in the western side of Poland and the fourth-largest city in the nation. Nestled on the banks of River Ode in the Silesian Lowlands, Wroclaw is enveloped by natural beauty, located near the Sudeten Mountains and Baltic Sea. A historical capital of Silesia and Lower Silesia, Wroclaw's story is enriched with a profound history that spans over thousands of years. However, Wroclaw is now presently a multicultural hub for finance and commercial entertainment, acquiring such prestigious institutions as the Wrolcaw Opera, National Puppet Theatre, Karol Lipinski Academy of Music and the National Forum of Music. 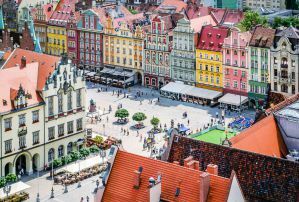 Deemed one of the most youthful cities in the country with a student population of 13,000, Wroclaw is rich in modern amenities, housing clubs, restaurants, bars, and shopping centers for all to explore. 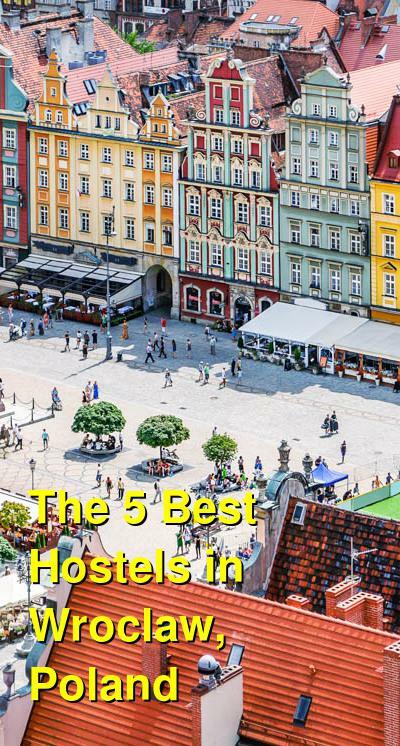 If you are looking to explore a city full of life and leisure without spending copious amounts of money, Wroclaw, Poland provides a diverse quantity of hostels for people of every walk of life. How much do hostels in Wroclaw cost? Friend's Hostel is a fishbowl for party-goers and night owls alike. Situated near the main square of Wroclaw, Friend's Hostel is surrounded by bars and restaurants that are at your disposal. Friend's also supplies its patrons with guidance to direct connections to airports and the main train and bus stations. Moreover, the hostel hosts pub and party crawls every Wednesday and Friday night for those who are looking to meet and greet fellow travelers and locals. Comfy mattresses within clean, colorful spaces, Friend's offers a diverse selection of room types, including single, double, twin, triple, quadruple, and dorms. The bathrooms are installed with only the most modern amenities and are quite clean. There are also pink and grey common rooms where you can watch TV, chat with roommates, and play table football as well as a fully equipped kitchen for your use. Besides this, Friend's offers other amenities like Wifi, bedclothes, tea and coffee, hair dryers, and irons. If you are looking for a hostel with a friendly environment and party scene, this is the place for you! Considered an outstanding hostel by most patrons, Grampa's Hostel is a quaint, clean, and cozy hostel that provides you with optimum service at a low price. The hostel has a total of 9 rooms, allowing it to hold no more than 48 guests. Five of the rooms acquire bunk beds and four of the other rooms are private and located in a separate section of the hostel. Unlike many hostels who provide only cheap pads as mattresses, Grampa's furnishes each room with real mattresses that will put you to sleep within seconds. The bedrooms as well as the bathrooms are clean and ready for use. There is also a common room where you can play games, read books, watch television as well as play PS3 and DVDs and a kitchen equipped with all your cooking needs. Other amenities include free Wifi, laundry service, included breakfast, free toiletries, computer stations, lockers, and spacious showers. Say hello to the friendly, English-speaking staff as you enjoy your stay at Grampa's! Another hostel considered quite superb by most is none other than the Moon Hostel. Located in the heart of Wroclaw, or the main square, Moon has 34 rooms that can hold one to eight people, with private rooms available with a reservation. Moon also acquires a common room that holds a television with a DVD player and Playstation and table football. Whether a public or private room, the bedrooms are quite spacious and kept clean and comfortable. Bathrooms are shared and kept in outstanding conditions as well. Breakfast and dinner are available upon request but are not included. Other amenities include bike rental services, lockers, laundry rooms, free tea and coffee, secured parking, and facultative trips. Experience luxury with affordability at the Moon! If you are a vegan or vegetarian looking to dine on some soy-based products in your hostel, you will love the eco-friendly air of Bemma. Also located in the heart of Wroclaw, Bemma is a fair trade hostel whose furniture and materials are from recycled, cruelty-free products. All lights within the hostel are appropriately powered by energy-saving light bulbs to reduce negative impact on the environment. There are a wide variety of rooms available from private to public, but all are clean, comfortable, and provide a step back into nature while in the midst of the bustling city of Wroclaw. Bemma is also pet-friendly and welcomes any and all four-legged friends to stay comfortably within its walls. Some other amenities include lockers, free toiletries, free linens and towels, free Wifi, and free tea and coffee. Embrace nature even in an urban setting at Bemma! Considered the most modern hostel in all of Wroclaw, the One is located on the main square and is housed within a 14th-century historic tenement. A building elegant in its ancient form ties in the modern world with its sleek designs that bring a unique character to the One. The One is also within the vicinity of many famous tourist attractions, including the Wroclaw Opera House, the Comedy Theatre, The Raclawice Panorama, Ostrow Tumski and a number of restaurants. Rooms can be both private and public and are kept clean and cozy for all its guests. There are common rooms as well as meeting rooms for those who are looking for a bit of social interaction during their stay. Other amenities include free breakfast, linen included, free city maps, and free Wifi. No matter how you stay in the city's hostels, don't forget to enjoy your time in Wroclaw, Poland!